My week so far, with Australian Sothys and Jurlique promotions. Its been a busy last two weeks. Couldnt really find the time to write anything of interest. My last week has been occupied with work, Candy Crush, planning for my trip to Vietnam and Bangkok, and now for my trip to Australia. I will be heading to Vietnam and Bangkok with a mate, and for my Australian trip, it is a solo trip. As far as I am concerned, Australia, New Zealand and Singapore are the safest countries I have been to so far. Its been close to two years since I left Sydney, and I want to visit my mates there. My main reason for visiting is just merely that. Yes, and I finally succumbed to the Candy Crush fever! Lol. I am now at the Mystery Level of 33 or 35. Can remember which. Yesterday afternoon was my maiden trip to Sothys office in Publika Level U6. It was actually a collaboration between The Lilac Box and Sothys to hold the Pyjamas Party for Lilac Box subscribers. I seriously think Sothys should target the segment of the market involving ladies from the older class market as they are able to afford more and they have more spending power! 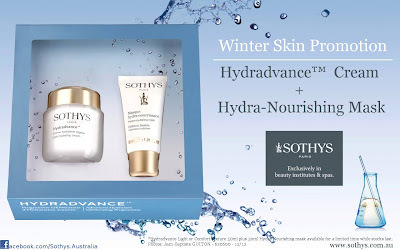 Speaking of Sothys, there is actually this Hydra Advance set that I wanted to get, retailing for Rm320 in Malaysia available at the facial salon I normally frequent in Scotts Garden. It consists of a Hydra Advance Mask and their Hydra Advance 50ml hydrating night cream. I actually saw the same set (pictured above)available as a Winter Special set in Australia for 90AUD. After conversion, it sells at about Rm270. Since I am not in a hurry to get it, I can wait till I am in Sydney to get my supplies as I dont want to lug stuff all around Australia when I am on a tour. Lol. I am also thinking of replenishing my Jurlique haul in MYERS when I head down there... yes, Jurlique can be quite cheap in Australia when you buy at the right time! Imagine paying only RM300 ish for 5 full size Jurlique products. Now that's what I call cheap. Check this link to find out more! Jurlique has this promotion from time to time even now, so its worth a go.